This standard inkjet printer is a great choice for anyone looking to print photos at home. Decently priced and well-sized for home use, this simple printer can easily sit on a desk top, without taking up too much space. In fact, it’s so small it’s practically portable, with a handle for ease of use that means you can move it around the house or further afield if necessary. Its reliance of mains electricity means it is not completely portable, but this is a great at-home printer nevertheless. The Epson PictureMate B271a measures roughly 254 x 152.4 x 152.4mm and weighs approximately 2.5kg. This compact machine is designed to look as portable as a lunchbox, although it does weigh significantly more and can be carried around easily. with smooth, curved edges and an attractive design, this printer certainly wouldn’t look out of place in any busy home. There is an easy to read LCD display as well as large, top-mounted controls which make it very easy to use. The main advantage to this machine is its size, as well as its economics. Printing photos at home can significantly reduce costs, and the Epson B271a does so with excellent results. 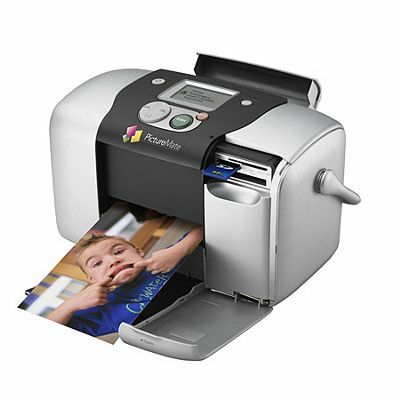 You can print your photos without being connected to a computer as the printer also has three multipurpose slots that can be used with a Compact Flash I and II, Microdrive, SmartMedia, Sony Memory Stick or similar. There’s a USB port as well as Bluetooth adaptor which can be used with any Bluetooth enabled device. The PictureMate B271a may be designed as a portable printer, but as it doesn’t run on batteries, it isn’t truly portable. The black and white LCD display means that you cannot crop photos before printing them, and the printing time is fairly slow in comparison to similar models.